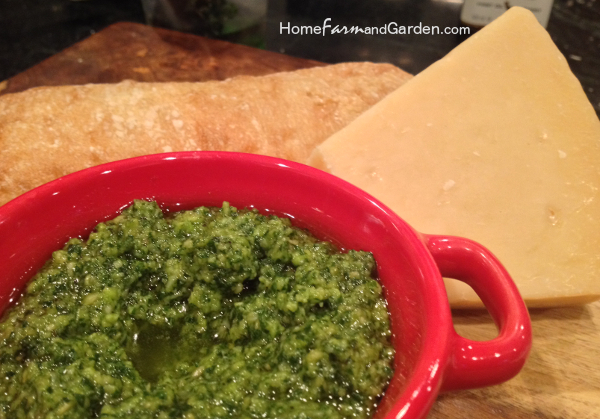 Fresh Basil Pesto with Toasted Pine Nuts is a versatile recipe you can use in so many ways. Try tucking some under the skin when roasting bone-in chicken breasts – or simply toss your favorite pasta, gnocchi, noodles or roasted vegetables in it. My personal favorite is to swirl a big spoonful on top of homemade minestrone or pasta fagioli soup or slather it on thick slice of crusty bread. I prefer to add a touch of fresh lemon juice because it really “wakes up” the flavor, especially when paired with a little salt. You can make larger batches of this recipe and freeze the excess in ice cube trays. However, air and pesto do not play well together – so be sure to cover the top of each ice cube compartment with olive oil. To toast the pine nuts, add them to a small dry skillet. Turn heat to medium-low and stir frequently until raw nuts start to turn golden brown (approximately 3 minutes). Be careful not to over toast. Remove from heat and set aside. 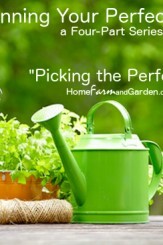 Remove basil leaves from stems, then wash and pat dry. Add basil, toasted pine nuts, peeled garlic gloves and Parmesan cheese to food processor or blender. 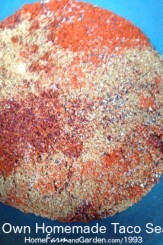 Quickly pulse until barely combined, then add 1/3 cup extra virgin olive oil and blend thoroughly. Add remaining olive oil, fresh lemon juice and/or additional grated Parmesan cheese to achieve the desired consistency. Season with salt and pepper, to taste. Psst… If you liked this recipe, please sign up below to get more delicious recipes featuring ONLY fresh, natural ingredients below!